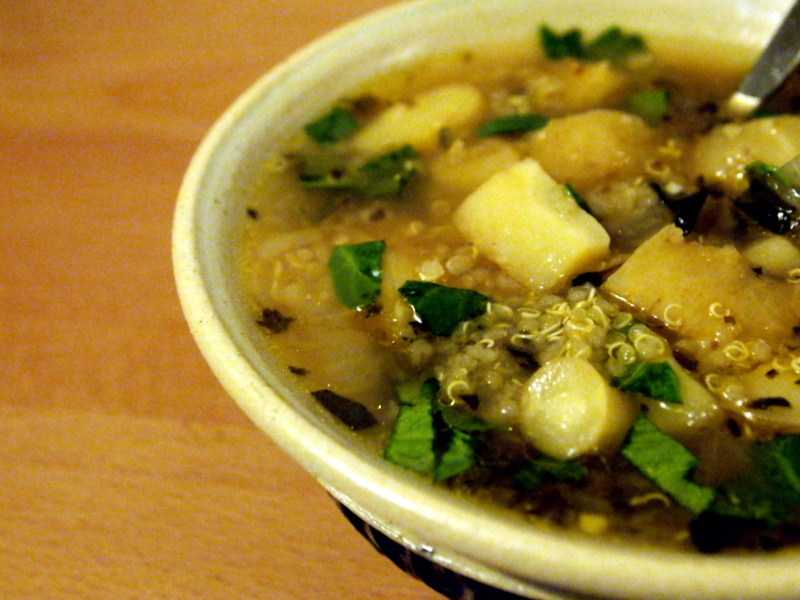 This soup, packed with herbs and quinoa, is very reminiscent of many soups we ate while living in Huaraz, Peru. The parsnips add a nice mild earthiness to this soup. Saute the onion and garlic in olive oil until the onion is translucent. Add celeriac and white wine and continue to simmer until wine is evaporated, another three to four minutes. Add the parsnips and saute for five minutes. Add broth, quinoa, and oregano. Bring to boil then cover, reduce heat to low, and let simmer until the quinoa is cooked, about 15 minutes. Serve garnished with fresh celeriac or celery leaves, diced spring onion, parsley, or other fresh herb of your choice.